Free yourself of Cable! 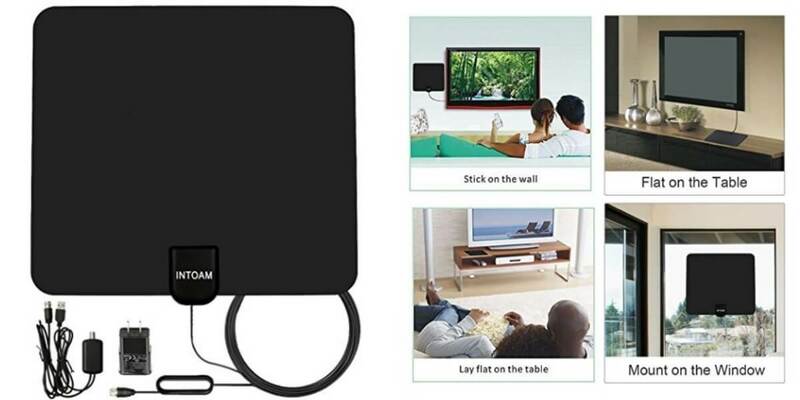 Get this Amplified HDTV Digital HD Antenna for $16.79 (Reg. $48.99) from Amazon’s Lightning Deals. So this will sell out! We freed ourselves of cable a year ago and we have an extra $150 a month in our pocket! You get all local HD channels plus a bunch of other channels with this antenna. These are NOT rabbit ears. It is even clearer than cable! Pair this with Sling or Apple TV and you will have almost every channel. Chose INTOAM : 30 DAY BACK MONEY GUARANTEE – 12 MONTH WARRANTY , Our digital indoor antenna is perfect for you. Should you experience any issues with reception or bad signaling feel free to contact us and get a refund (within 30 days after the purchase). We are pretty confident about the quality of our antenna that is why it comes with a 12 month warranty. 50 Miles Rang, Suport Format: 720p, 1080i, 1080p & Frequency Range: VHF 47-230MHz, UHF 470-862MHz. FREE LIVE : free HD Channels like ABC, CBS, NBC, PBC & Fox in 50 miles rang from Broadcast Tower, start to access all of the news, sitcomes, kids amd NBA sports programs! Our indoor amplified antenna can save you a lot of money. Never pay for your precious television stations ever again. This antenna, will definitely save you time, energy and of course money! No more careless spending, since this antenna can provide everything you need for free! INTOAM YOUR BEST CHOSE : 1), high quality products. 2), received a 30-day unconditional return. 3), within 10 hours of the mail response. 4), INTOAM brand products have been sold all over the world, we have the perfect production, sales and after-sales service. Give our customers the best service and security. Gap: 40% Off Entire Purchase, Boys Polo $5.99!